I love my OOAK (Original One Of A Kind) Halloween Black Cat Art Work so much that I'm working some of my original black cat art collections into Christmas cross over decorations. Here's my JOHANNA PARKER OOAK Halloween black cat collection that I've added to my fiber optic Christmas wreath. I was delighted to have acquired Johanna's original Flower Pot Black Cat featured in the Better Homes & Garden October Holiday issue. Johanna's pretty gift Black Cat Candy Box is the purrrrrfect finishing adornment! Christmas Cross Decorating, it's a good thing. AND FUN TOO! My home is an ENCHANTING WONDERLAND because of the beautiful original art collections I have invested in. I love this easy & quick holiday recipe, it's what my Mom called Semi Homemade. 1. Preheat oven to 350°F. Divide dough in half; wrap half of dough in plastic wrap & refrigerate. Roll out remaining half of dough on well floured surface to 1/8-inch thickness. Cut with cookie cutters to resemble wreaths. Repeat with remaining half of dough. 2. Place cutouts about 2 inches apart on ungreased baking sheets. Bake 7 to 9 minutes or until edges are lightly browned. Remove cookies from baking sheets to wire racks to cool completely. 3. 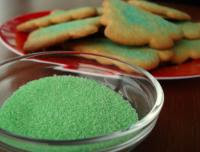 Frost cookies with frosting & decorate with green shredded coconut, green sugar & cinnamon candies. Here is the 'How To Recipe' for making your own colored sugars & shredded coconut for your favorite pastrys. This is a great money saver & the recipe can be kept in jars for months. 1. Place sugar or shredded coconut into a jar with a tight fitting lid. Drip the food coloring onto the sugar or shredded coconut, close the lid & shake vigorously for about 1 minute. Adjust color with additional food coloring & repeat if the color is too light. *Bon Appétit & Happy Holidays!!! To all my friends reading this please check out the fabulous SANTA CLAUS FEST ACTIVITY HEADQUARTERS for all the wonderful holiday open house party links around the world! WOW what a fun treat this am while enjoying my cup of coffee! LOVE your collection of Johanna's black cats and they look quite stunning in the Xmas wreath! Love Christie's "Mr Wishes" clock too! Yum, yum, YUMMY! You always have such interesting recipes, Lyndy! Hi Chris, the holiday season should be magickal with good friends, good music, good food & most of all enjoying the blessings one surrounds themselves with! Hi Becky, I love homemade cooking. But when I'm pressed for time semi homemade is easy, quick & delicious too. I always buy the best products so everything really does taste YUMMY! The Colored Sugar & Colored Shredded Coconut is truly a good thing! Extra Colored Sugar can be in a crystal sugar bowl on a festive holiday table of delights. Hi Iva, I'm so glad you stopped by for a little visit. 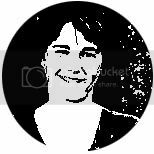 Delighted to trade Blog links too. I see Chris found you through our linking. Great PR: 'Links For Links'! It's like following the yellow brick road to places of magick & enchantment. Your Christmas creations are wonderful. Thank you for the compliments. I'm going to Christmas Cross Decorate more of my beautiful OOAK Black Cat Art collection for the holidays. Art & Music is very healing & yet sometimes it can bring a flood of tears from even the best memories of loved ones that have past. 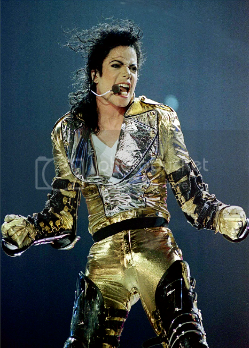 We just need to stay strong for those that count on us & in doing so we will get through the sadness with fortitude. I love sharing my Mom's recipes. My best memories of my Mom were in the kitchen as a little girl helping with the holiday cooking & baking. She always said she was cooking or baking comfort food for the mind, body & soul. Hi Carolee, thanks for the compliments. I'm going to Christmas Cross Decorate more of my beautiful OOAK Black Cat Art collection for the holidays & hopefully post more photos. I really truly believe the holiday season should be magickal with sincere family & friends, fantastic music & mouth watering delicious comfort food. AND most of all, enjoying the blessings one surrounds themselves with! I'm very happy to be able to actually share my love for the Celebration Of Life, Art, Music & especially my Mom's comfort food recipes with anyone that welcomes these little musings. Cooking & baking can be very healing like art & music. My Mom always said she was cooking or baking comfort food for the mind, body & soul. Well, writing, art & music can also be comfort food for the mind, body & soul. 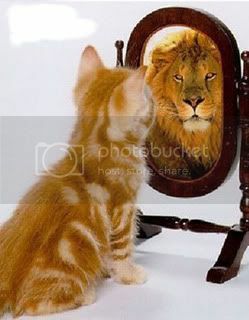 Wow, I love what you've done with Johanna's cats.. how creative! And who would not just die to have one of Christy's clocks?? I thought of you this morning, te fog was wrapped around the hills and covering the bay. But no time to grab the camera, darn! Thank you for sharing your wonderful recipes, I think it's a great day to make cookies! Hi Kitty, thanks for thinking of me. I wanted to photograph the fog this morning too. But my camera needed new batteries. Since holiday accenting with my darling Johanna Parker Design's, I can't wait to work on more original black cat art Christmas Cross Decorating. I'm still trying to perfect my Mom's holiday coffee cakes. I'll be adding more holiday comfort food recipes. Lyndy, what a beautiful idea, combining Johanna's black cat creations with Christmas! Yeah...and I see a familiar looking whimsical clock, too! I like combining my Shafford black cats with all holdiays. Their red ears and green eyes go so well with Christmas colors. Ahhhh Lyndy!... You beat me to it! 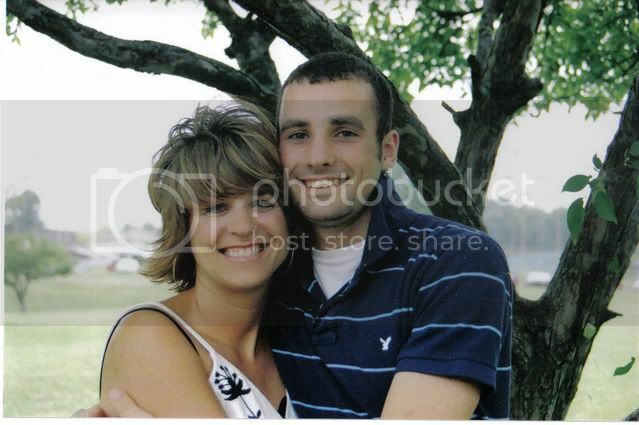 Thanks for sharing these delightful pics with the folks in blogland! I too just love how my creations look all together in that wreath...How clever!..... And Christy's clock is purrrrrfect! Lyndy, thanks so much for your lovely post on my blog tonight. You always say the nicest things. I am loving the cross-decorating and glad you are as well! Your Johanna infused pieces are great and Tom's modified train sounds like a FUN project!! Thanks for the idea to MOD my own train creative lady! Surprisingly I would have never thought of that! 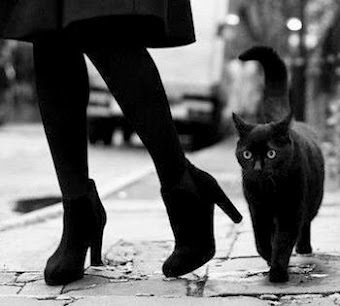 Hi Becky, I love the Shafford Black Cats too. 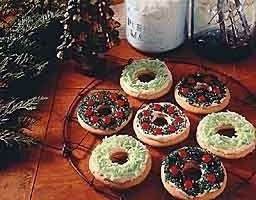 Your right they look great at Christmas time & all year long. Hi Chris, thank you too for your enthusiasm. It warms my heart that I inspire you, as you do me. I'm working on more Christmas Cross Decorating ideas. So stay tuned for some real eye catchers! Wow wonderful. Really nice deco. Have a great Day. Beautiful and the recipe sounds great. have a wonderful day. Wow, what a great idea to add your black cats to the christmas decoration - and thank you so much for the receipe... Have a nice Santa´s Day "ho-ho-ho"
i really enjoyed this wonderful post and the CATS!!! thanks for showing these photos and for sharing the recipe ... sounds very interesting! have a joyful advent time! your ornaments are fabulous and very unique - great crossover! the deco goes right with it. and thank you for sharing these yummy recipes! Oh thank you all so much for the wonderful compliments. This is great fun! It really does feel like Christmas now. To all my friends reading this please check out the SANTA CLAUS FEST ACTIVITY HEADQUARTERS for all the wonderful December 6th open house party links around the world today! What a nice surprise. I went to Chris's blog and heard about your open house. So I decided to drip in. Boy and I glad! I truly enjoyed everything. I love the Johanna wreath and the CCwhimsies clock. I am glad I could be a part of your holidays. These are so beautifully presented - you have worked hard. The music is just right - pure imagination! Hope you're enjoying the day. Mein lieber Sandy, Ich moechte mich bei Ihnen dafuer bedanken, dass ... everything & such a WUNDERBAR Sinter Klaas Fest!!! Danke schoen! Mein lieber Hermine, Ich moechte mich bei Ihnen dafuer bedanken, das Besuchen. WUNDERBAR Sinter Klaas Fest!!! Danke schoen! Mein lieber Heike, Ich moechte mich bei Ihnen dafuer bedanken, das Besuchen. WUNDERBAR Sinter Klaas Fest!!! Danke schoen! Mein lieber Fatma, Ich moechte mich bei Ihnen dafuer bedanken, das Besuchen. Die Internetseite und Stampfts ist Schön!!! Die Internetseite und Abbilder Schön!!! Mein lieber Dymphiem, Ich moechte mich bei Ihnen dafuer bedanken, das Besuchen. Mein lieber Ilonka, Ich moechte mich bei Ihnen dafuer bedanken, das Besuchen. Die Internetseite und Kunstschätze!!! Mein lieber Belinda, Ich moechte mich bei Ihnen dafuer bedanken, das Besuchen. WUNDERBAR Sinter Klaas Fest!!! Danke schoen! Mein lieber Katrin, Ich moechte mich bei Ihnen dafuer bedanken, das Besuchen. WUNDERBAR Sinter Klaas Fest!!! Danke schoen! Hi Chris, you smarty party... YOU understand the art of PR!!! THANK YOU FOR VISITING ON SANTA CLAUS DAY! Hi Kim, I'm so glad you stopped by for the Santa Claus Day Party... You know I love Ya!!! Hi Ros, thank you so much for visiting my Santa Claus Fest. It was a lot of work & I enjoyed every minute of it. You have a beautiful site too! Hi Tina, thank you so much for visiting my Santa Claus Fest. I loved being a part of this wonderful holiday! Christmas is wonderful but I especially love Halloween! 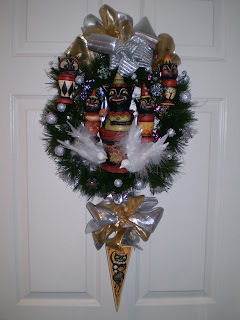 So, I posted your Hallowmas black cat wreath photos on my blog today! I just love how you combined the 2 holidays! It's delightful! Thank you again for sharing my creations with the world! OMG, Lyndy! Just now found your comment on my blog (either blogspot didn't send me a message or my email is acting up again). Looks like I missed all the fun....What a wonderful idea to have an open house on St. Nicholas Day, and your crossover decorations are WONDERFUL! I see so many pieces I recognize. Thanks as always for your support of OOAK art!! Gorgeous wreath Lyndy! Lucky, lucky, lucky you!!!!!!! And Christy's clock is gorgeous! I own a party girl clock of hers and I just love her so much! Thanks for sharing your beautiful decorations! Hi Johanna & Kitty TOO, sorry you girls missed Sinter Klaas Fest! It was WUNDERBAR!!! You can still visit the Santa Claus Site anytime though. It was a lot of fun & great International PR. I won something from the Santa Claus Fest Gala hosted by Wednesday Stamper from Germany for my blogsite Santa Claus Day presentation, I can't wait to see what it is. 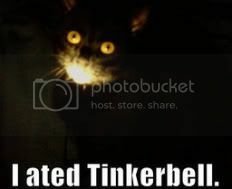 Your whimsical Black Kitties look even more beautiful on your blogsite. You really do have that magic touch! 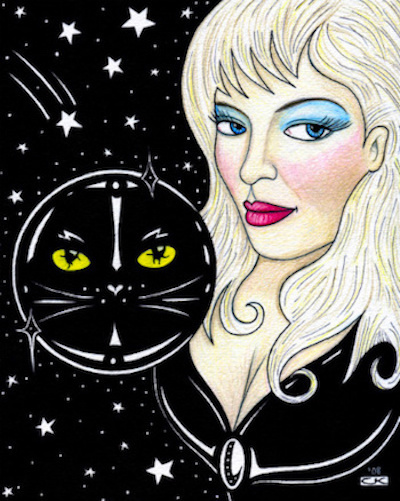 I will be adding more of my favorite artist's original black cat artwork Christmas Cross Decorating to my blogsite for the holidays. 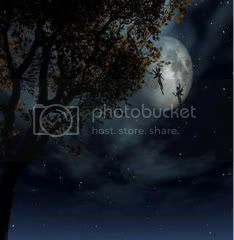 This is really fun combining the MAGICK Of HALLOWEEN with the ENCHANTMENT OF CHRISTMAS!!! Hi Carolee, sorry you missed Sinter Klaas Fest too! Like I said it was WUNDERBAR!!! You can still visit the Santa Claus Site anytime though. It was a lot of fun & great International PR. I won something from Germany for my Blogsite Santa Claus Day presentation too, I can't wait to see what it is. Hope John is feeling a little stronger & you are staying well. Hi Lori, so glad you stopped by for a visit. I wish as you say Crusty would. It might brighten up her day to see her beautiful artwork 'Mr. 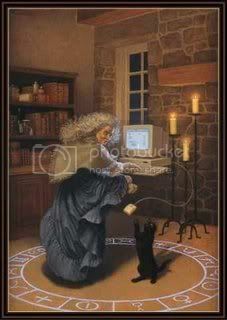 Wishes' the black cat clock appreciated by so many around the world!!! Please let her know... AND your Crusty Party Girl Clock sounds adorable too! 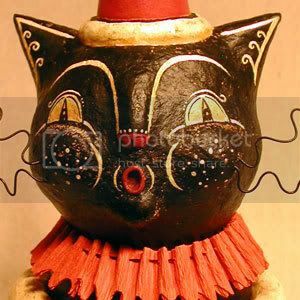 Thanks for telling me about the Santa blog Lyndy, I love your black cat clock-what artist created it? Hi Suzanne, sorry you missed Sinter Klaas Fest too! The third PIC reveals my beautiful black cat clock 'Mr. Wishes' is a OOAK by Christy Meyer AKA CCsWhimsies. The Santa Claus Fest was WUNDERBAR!!! You can still visit the Santa Claus Site anytime though. It was a lot of fun & great International PR. 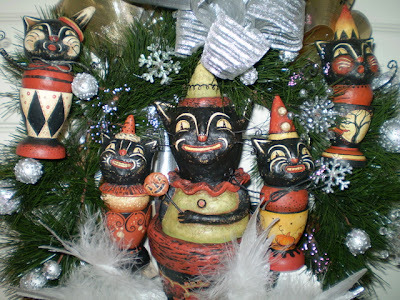 Johanna is showing my Black Cat Cross Over Christmas Decorations on her blogsite & they look even more beautiful. 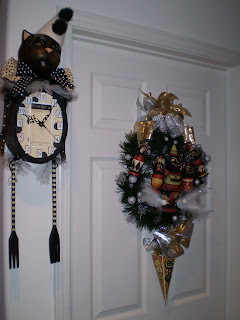 I will be adding more of my favorite original Black Cat Art Christmas Cross Decorating to my blogsite. Your blog gets more beautiful everytime I visit!!! You could charge admission! May I ask you a question... do you know if there is a way I can get some of guitar music to play on my blog whenever someone visits? Wow! What a great way to display your Johanna Parker cats! I love her work too. Hi John, you are the best Blog Meister. When I feel a little sad I know you'll always make my day with your kind words. I have sent you an email & left you info on your blogspot. You're such a doll!!! 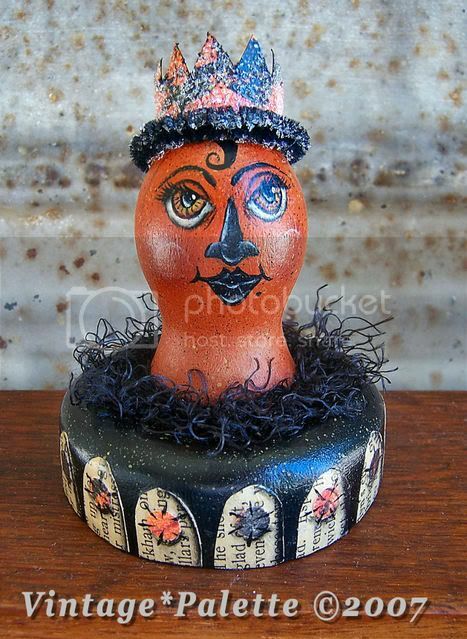 Hi Cathy, I love Johanna & her whimsical folk art too. Thank you so much for stopping by & leaving such a sweet comment. Hi Lori, thanks for the MeMe Tag. I really do think it's another great linking Spotlight Game bringing one's blogsite up in the search engines though one's answers as Tag Words. Also, it's always fun when you stop by!!! Hi Robert, thanks for the comment.